Wood pellets are made of super condensed fine wood particles, held together only by natural sap within the original wood fiber. If you’re curious about the wood pellet creation process, check out our post about how wood pellets are made. Premium wood pellets burn so hot and so easily because of their very low moisture content. Unfortunately, these little heat powerhouses are unable to withstand direct contact with water. The time lapse video below will show exactly what happens when pellets become wet. If at all possible, we strongly recommend storing your fuel inside – in a dry area free from flooding, mold, and excessive humidity. If you have the space, reuse the 40 x 48 inch wooden pallet your fuel arrived on. The pallet is handy because it raises your pellets off the ground – and it’s built to hold weight. Therefore, if you only have a small space, you can stack your pellets nice and high. However, these 40lb bags can be slippery if they aren’t angled carefully. Make sure to keep in mind the risk of bags sliding off the top while you’re creating your pellet stack. For a helpful stacking tutorial, check out our post on how to safely stack three tons of pellets in a small space. No garage or inside space to store your wood pellets? That’s fine – as long as you take extra steps to protect them from the elements. When your pellets arrive – whether you’re storing them inside or outside – be sure to fully inspect them. The protective shroud could have some weak spots or tears from the delivery process. Repair any rips or holes in the plastic shrouding with water-proof tape or additional layers of plastic. 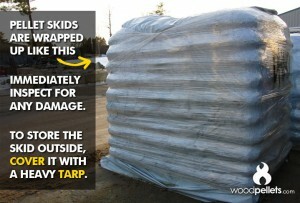 If any pellet bags have been damaged, please call 1-800-PELLETS right away. After your shroud has been inspected and touched up – we very strongly recommend adding a securely fastened tarp over your fuel. The tarp will further protect it from water and from any birds or squirrels that may try to puncture the plastic to get inside. If you have any questions, please give us a call at 1-800-735-5387. Happy heating!